Join the discussion on our forums! Come discuss Potion of Heroism over in our dedicated Potion of Heroism discussion topic. Give a minion Divine Shield. Also known as "Liquid Courage." So, if you can't get this from Kabal Chemist why in the name of Zeus would you name it "potion"? doesn't this work well with The Voraxx? It's 2 draws right? Correct. If The Voraxx copies Power Word: Shield, you draw an additional card, so this card should work the same way. Kinda ok with Kabal Chemist I think, but generally decks that run Chemist want the board clears. But then again, control wants some draw too so I think this is a great card to get. Stand alone, it's alright, like a better power word shield in a decent number of cases. Chemist won't be able to give you this card. I tried and tried and it doesn't give this potion. Must be a counterfeit potion. "2 mana spell. Target a friendly minion and do X to it. Draw a card." But compare this to Powerword: Shield and I can see why it's 2 not 3. 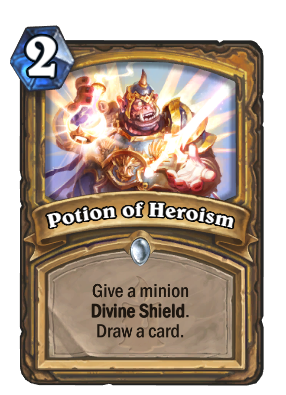 This is a great Paladin card. Divine shield and draw, low cost, synergy with Lynessa Sunsorrow (which will get you the shield and the draw both) among other things. Might even make it more worthwhile to run a Primalfin Champion in a non-Murloc deck. The Lich King told him he'd support his addiction.